Indian humped cows have suryaketu nadi(vein) passing through hump which absorbs all cosmic energies( 33 CRORES of gods & goddess reside in cow). As per astrology SURYA( which rules soul) and KETU (Lord of Moksha). 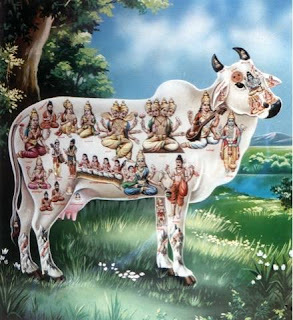 Means Humped cow helps soul attain moksha(liberation)? We need to remember, we have nine planets starting from Sun and ends with Ketu. After death soul should cross VAITARINI RIVER(which is very difficult) if we donate a cow before death. we can cross this river with the help of cow tail. This sentence describes that we need to protect cows and pass them to future generations. The human body has 7 CHAKRAS(energy centres) described in Ayurveda and having 72000 nerves. Same like we can assume cow have 33 crores of nerves and all connected to suryaketu nadi( same as our backbone)? IDa-PIngala are the main nerves which connected to Left/Right nostrils and pass oxygen to all parts of human body, eliminate toxins as co2. In the same way, Surya-Ketu nadi was functioning in Cow? Surya ketu Nadi, on interaction with solar rays, produces GOLD salts in her blood. These salts are present in the cow's milk and cow's other bodily fluids which miraculously cures many diseases. That's why cow milk or ghee in golden hue colour. Old sacred writing state that "Suryaketu" nerve on cow back assimilates negative radiations and purify the atmosphere. Minor nearness of cows is an awesome commitment to the environment. Tongue - secured with finger-like projections (papillae) that contain taste buds. Salivary organs - discharge salivation, that saturates nourishment and is blended with the sustenance material to help in gulping. Multi-chambered "stomach" the first is Reticulum - honeycomb-like interior surface, this part helps to remove foreign matter(sponge,paper,plastic,toxins,wires,etc) from the food material. The second one is Rumen - the organ that allows for the bacterial and chemical breakdown of fibre.The rumen has a very thick, muscular wall.It fills most of the left-side of the abdomen.the rumen can have a capacity of 55-65 gallons.The walls of the rumen contain papillae (that can be up to 1 cm. in length), where the bacteria that are used to break down fibre live. THERE ARE SEVERAL ANAEOROBIC BACTERIA INSIDE COW, WHICH CAN PRODUCE GOLD. 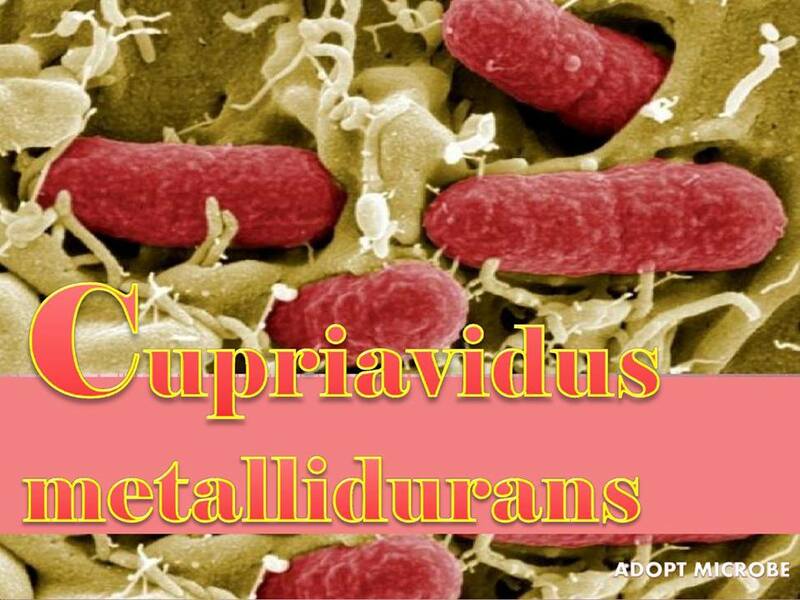 FOR EX: CUPRIAVIDUS METALLIDURANS BACTERIA CAN GROW MASSIVE CONCENTRATIONS OF GOLD CHLORIDE. THIS BACTERIA EATS TOXIC MATERIAL AND EXCRETES PURE GOLD. 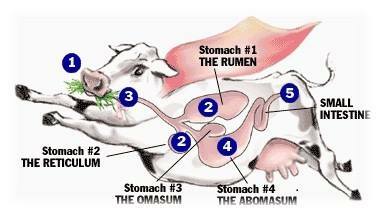 The third chamber is Omasum - a section that is round and muscular.“Grinds” the food material and prepares the food material for a chemical breakdown. Abomasum - this is where the majority of chemical breakdown of food material occurs.mixes in digestive enzymes (pepsin, rennin, bile, etc.). Taking everything into account, the rumen permits microorganisms to break down fibre, empowering cow to pick up the proteins and vitality from plant sources. A cow is one of the creatures which has longest stomach related framework that contains a decent number of microorganisms. Due to this the milk, ghee, urine, dung have potential benefits which are helpful to the persons to consume or use it in daily life. During the ancient period, people would apply a layer of cow dung on an outside wall and also for flooring they used cow dung.There exist three types of radiation, ALPHA, BETA AND GAMMA. Out of three, the alpha rays do not have the power to penetrate the layers of cloth, on other hand beta rays, falls after hitting the layer of cloth. Lastly, Gamma rays are the only rays which can penetrate the body tissue and it is harmful. Research studies have proved that cow dung has the power to absorb three types of rays, alpha, beta and gamma. And thus, people in the house are not affected by radiation. Thus, these properties have helped people whose houses were coated with cow dung to escape Bhopal gas tragedy held in 1984. Both cow dung and ghee are agencies which release Nitric oxide.Copper is involved in the production of Nitric Oxide.Nitric Oxide is a bio signaler. People with diabetes usually have lower levels of Nitric oxide than patients without diabetes.Hydrogen sulfide (H2S), from cow dung, has its own certain functions similar to those of nitric oxide (NO), is actually a partner with NO in growing new blood vessels. In Alzheimer's disease, the brain's hydrogen sulfide concentration is severely decreased. You all know benefits of Agnihotra using dry cow dung cakes and ghee. Sanskrit Sloka : "matrah sarva bhutanam, gavah sarv sukh prada"
Translation: The cow being the mother of all living entities gives all pleasures to everyone. Cow acts as a surrogate mother by providing milk to human beings for the whole life. No animal drinks the milk of any other animal. So COW is the mother of the human race.